This uniform jacket is of the 1980's to the 1990's period. It is a US Navy, Woman's, Service Dress Uniform. This uniform is in MINT - unissued condition. There is still the paper, factory applied tag found on the cuff. This black color uniform is not size marked, but appears to be a size small. The museum was lucky enough to purchase a whole bale full of these uniforms from a government scrap sale 7 years ago. We have many of the same size to offer (sorry no larger sizes were found). 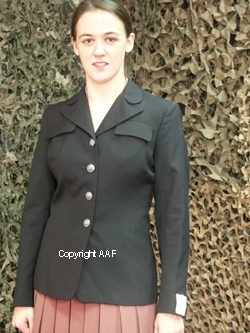 It is interesting to note that we have sold quite a few to women who currently wear them as a sort of dress blazer, after adding non military buttons! These modern uniforms can't be replaced for the price.